For LACMA’s group exhibition “A Universal History of Infamy,” Porras-Kim produced a drawing indexing 109 Colima ceramics, organized by scale, to illuminate the ancient culture of Colima through the formal analysis of its artifacts. On the label of the drawing, Stafford’s name is omitted. Juxtaposed with it are six clay sculptures created by the artist referencing shapes commonly found in Colima ceramics. GPS devices are attached to these sculptures to track their migrations, assisting with provenance in case they become artifacts in the future. Within the context of this encyclopedic art museum that, according to James Cuno, CEO of the Getty Foundation, “encourage[s] identification with others in the world,” these ethnographic items are converted into art. Employing the same logic of authorial control, Porras-Kim places representations of antiquity in the Broad Contemporary Art Museum at LACMA to transform them into contemporary art, and to turn Stafford into a Duchampian artist. In addition, two tours to the gallery of the Art of the Ancient Americas will be given during the show: one regular tour by a museum curator, and the other by Porras-Kim with proposed descriptions updated to remove or minimize the association of these ancient Mexican artifacts with Stafford’s name. To the artist, publicly crediting a single western collector validates both Stafford’s “discovery” of Mexico’s past and the looting of ancient artifacts. The problematic naming protocol also arbitrarily demarcates these ceramics from others from the same period of time and region. Porras-Kim’s requests to access Stafford’s original stipulations and reconsider the museum’s classification system have been denied. During 2016’s Current:LA Water, a biennial organized by the Department of Cultural Affairs featuring public art along the Los Angeles River, Porras-Kim extended this observation into contested urban social space. She created signage in the wetlands of Marina Del Rey marking the sacred burial grounds of the Native American Tongva tribe in situ, as well as detailing the legal loopholes that the real estate developer took advantage of to remove skeletal remains and eventually plunder the land for luxury condominiums. Needless to say, the artist’s signage was protested by the developer, who was backed by a prominent politician. Porras-Kim’s gestural device of reframing and transfiguring commands attention to bias in the politics of alterity where it sets forth particular notions of identity for peripheral cultures and civilizations. Her engagement with both ethnography and art allows her to appropriate methodologies from both fields to weave narratives highlighting the gravity of social, ethical, political, and aesthetic conditions of the subject, inviting us to critically contemplate what we know and how we know it. The protagonist in her narratives is history, a history that exists outside the parameters of imposed knowledge and emerges from the Third Space, proposed by Homi Bhabha, where the western rhetoric of authority is intervened and displaced. -Gala Porras-Kim (b. 1984), born to a Korean mother and a Colombian father, is a Los Angeles-based artist whose practice is anchored in the liminal space of identity, problematizing the notions of cultural knowledgeability and authority. Many of her works explore linguistic and visual representations of Mesoamerican and Korean cultures in the neocolonial era. 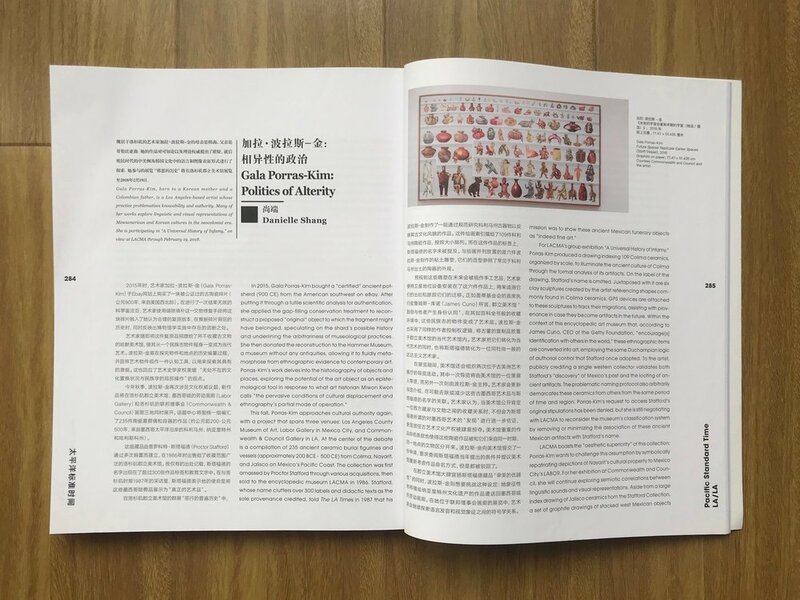 Both the original English essay by Danielle Shang and the Chinese translation by Anqi Li are published on the LEAP Magazine, 2017 Fall/Winter Issues, from page 284 to 286.